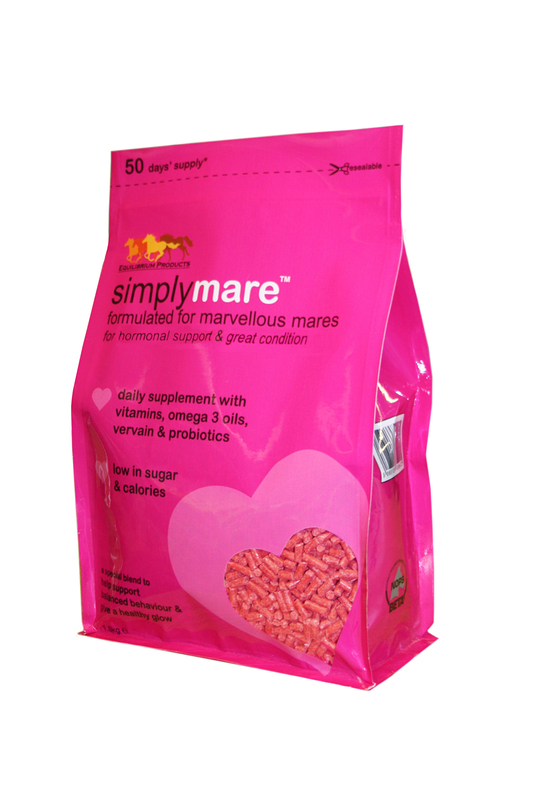 SimplyMare is a daily feed supplement, formulated to have your mare looking her best & feeling calm. It is low in sugars, starch & calories, so is non-heating. SimplyMare contains vervain, the calming herb; Omega 3 oils & Vitamin B6, to give added support during her hormonal cycle. Biotin; Methionine & Lysine, are included too, they promote healthy, strong hooves, as well as a shiny coat, mane & tail. Added live yeast encourages good gut health & helps her to absorb all the essential nutrients from her diet. SimplyMare is suitable to feed to any mare, all year round but can be particularly useful: - During hectic competition seasons, to support her temperament, performance & condition - At other times, when she needs some extra help to keep a balanced temperament SimplyMare comes in a resealable bag, to maintain freshness. Feeding Instructions: 30g daily for a horse 15g daily for a pony 1.5kg lasts a horse for 50 days, or a pony for 100 days. All Equilibrium products are Beta NOPS accredited & made in the UK. Simply Irresistible is an all natural feed topping containing antioxidants & probiotics, designed to encourage your horse to eat & promote a healthy digestive system. It's great for fussy eaters, or if trying to feed wormers; medications or supplements. Redplex + is a supplement formulated by Audevard, designed to support horses in hard work & increase their red blood cell production. Zzen is a calming supplement, formulated by Audevard. It contains Magnesium; Tryptophan Vitamin B1 & B6, ingredients found in succesful calming supplements. NAF Oestress contains effective herbal extracts, to support your mare's hormones throughout her oestrus cycle; as well as magnesium to promote calmness. It's also rich in antioxidants, to boost overall health. Mega Base is a comprehensive, high quality, balanced, vitamin & mineral supplement, that also contains pre-biotic, to aid digestion. It's suitable for all horses, but is particularly beneficial to horses in work, competition/race horses or broodmares. Equistro Equiliser is an effective calmer that contains a combination of key ingredients known for their ability to improve horses ability to cope with stressful situations. It contains Tryptophan; Magnesium; Niacin; Vitamins B1 & B6. Cavalor Take It Easy is a calming paste that is designed to be used to reduce stress before a specific event eg. competing; travelling, vet/farrier/dentist visits. They contain a high amount of Tryptophan, as well as Magnesium & Vitamin B1. Equiton is a premium quality, balanced liquid feed supplement, formulated by Ireland’s top Vets & nutritionists. It contains 8 essential vitamins, 11 minerals & trace elements, as well as vital amino acids. It’s ideal for competition, breeding & race horses, but can be used for any horse you want to be at their best. Good As Gold is a calming supplement designed to be fed to nervous or stressed horses.